Held in the ballroom or in a spacious conference room in one of San Francisco’s grand hotels, where stunning chandeliers hang from the vaulted ceilings with their frosted glass skylights, the Grands Crus de Bordeaux tasting event is a wondrous affair. Elegant even in daylight, the ambience is further enhanced with an enormous bouquet of dazzling red roses at the entrance. Inside the room are tables covered with crisp white cloths for each of the presenting chateaux, and across the front is a table holding rows of gleaming wine glasses. Situated strategically throughout are enticing stands of cheeses, fruits, and thinly sliced baguettes, all adorned with more flower arrangements. All done to heighten anticipation for the main event: the wines themselves, and the particular appellation each represents. 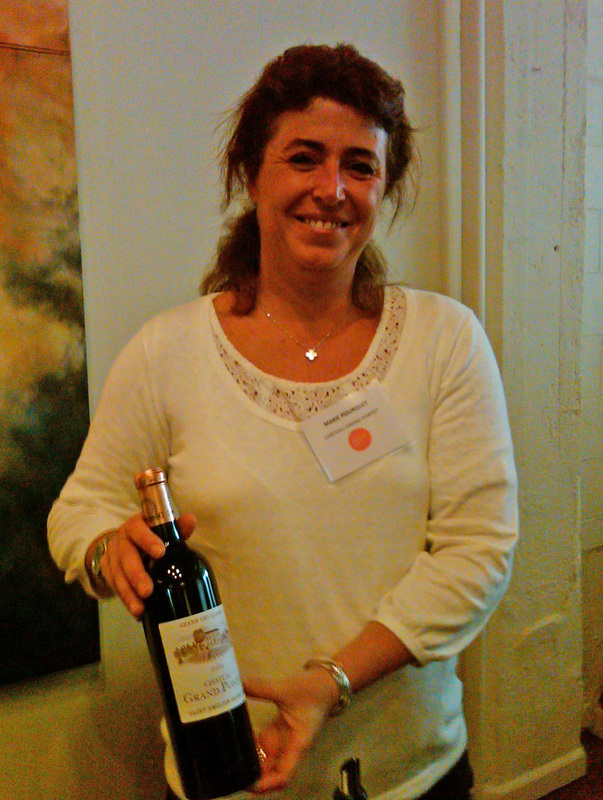 The 2011 event was my first experience with the wines of Bordeaux. Frankly, I was quite overwhelmed. Apart from the Sauternes, which are all sweet white wines, Bordeaux AOCs are predominately red wine appellations. So many wines (upwards to 200); so many soil types (a dozen or more appellations): how to distinguish! So I was delighted to have encountered Monsieur Portet; his words gave me a direction, and some sense of what to expect, and what not to expect. Certainly not the big, luscious, fruity wines of the annual California Zinfandel (ZAP) tasting, which represents most of California’s prime Zinfandel regions. Most of these wines have forward fruit of red or black berries, ripe currants, and other luscious fruits, and carry alcohol levels of 15% or higher; some reek of oak. Rather, expect a less fruity, less luscious wine, leaner, with perhaps more spiciness and earthy fruit tones, and with alcohol levels of from 12.5% to 14%. And definitely NOT smothered in oak! The primary appellations of Bordeaux are commonly referred to as “Left” and “Right” bank, which refers to the two rivers, the Garonne and Dordogne, running north-east through the Bordeaux peninsula. Left Bank are vineyards to the west of the rivers; Right Bank are vineyards to the east of these rivers. There is also AOC Entre duex Mers, which occupies the land between the rivers. The Right Bank appellations consist of the AOCs Pomerol, Saint-Emilion, and The Côtes, together making up the region surrounding Libourne, the principal city of the right bank. The wines of the Right Bank AOCs are Merlot-based, and are enhanced and balanced out with varying percentages of Cabernet Franc and Cabernet Sauvignon. The most prestigious are the heady wines of Pomerol and Saint-Emilion. Pomerol, the tiniest Right Bank appellation, is distinguished by its iron-rich clay soil. The Merlot-based wines from this appellation are blended with small percentages of Cabernet Franc, and are renowned for their silky tannins and soft elegance. 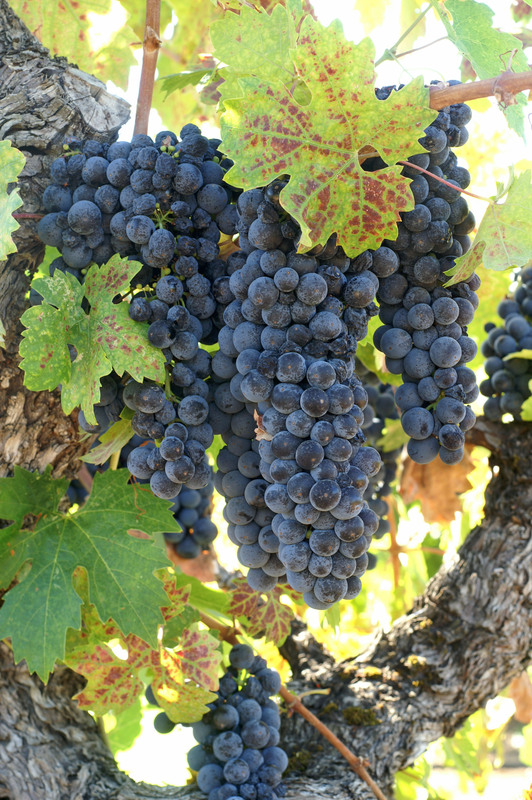 It is not uncommon that they have some of the Zinfandel fruitiness, notable for flavors of prunes that are typical of Zinfandels made from super-ripe grapes. There is no classification system for Pomerol. The most prestigious wines of this appellation are Petrus and Le Pin. The soil of the adjacent and much larger Right Rank appellation of Saint-Emilion is mostly limestone-based, which produces more structured Merlot-based wines that are usually blended with varying percentages of Cabernet Sauvignon, and in some instances, also with a bit of Cab Franc. The limestone-based soil also yields wines of higher acids and robust yet elegant tannins. These wines, while showing less of the fruitiness and more structure than the Pomerols, are nonetheless softer wines than are usually found in Left Bank Bordeaux wines. For those of you whose perceptions of Merlot wines were soured by the raging invective against Merlots leveled by the character Miles in the 2004 Hollywood film Sideways, I recommend a second look, both at the wines and at the film. For while Miles shrieks at his lecherous pal, Jack, as they approach their first bar to mark the beginning of Jack’s week-long pre-wedding sexual debauchery, “I am not drinking Merlot,” yet the prized bottle that he has been hoarding for his 10th wedding anniversary celebration is a bottle of the much-coveted 1961 Château Cheval Blanc, ironically, a Merlot-based wine. The variety (Merlot) is not the problem, as Miles unwittingly reveals in a conversation with his friend Maya a few scenes further on. The problem he has, or thinks he has, with Merlot, is, of course, with himself! Sadly, there is no mention in that scene, or anywhere else in the film, that Miles realizes that his Premiere Grand Cru Classé A Cheval Blanc is Merlot-based, which acknowledgement might have spared California’s Merlot growers some of the financial losses that Miles’ ignorant tirade against this variety cost them—not to mention greatly enhancing the screenplay! The scene between Maya and Miles at Stephanie’s house (while Stephanie and Jack have retreated to her bedroom) could have been the perfect place for this revelation. When Miles tells Maya that he has this 1961 Cheval Blanc in his tiny “gathering” of wines, I could envision Maya casually remarking how wonderful and long-ageing a Merlot can be under the right circumstances and in the hands of a knowledgeable winemaker. So, too, can a single line in a screenplay transform a film. A further irony occurs at the end of the film when Miles, depressed with the realization that his ex-wife is never coming back and that there will be no10th anniversary celebration with his Cheval Blanc, he finally and surreptitiously drinks this prized wine out of a plastic cup while dining alone on a hamburger in a fast-food roadside restaurant. And, the film suggests, does so with great enjoyment. So a great Merlot can be enjoyed just about anywhere and with any food. So much for Miles’ misplaced outrage, actually one among many, indicating perhaps that the film itself should have been “misplaced” into some obscure corner before it ever made it to the theaters. But I digress . . . now back to the wonderful world of Grands Crus de Bordeaux! The Medoc is the largest appellation in the Left Bank. It covers most of the peninsula between the Gironde (the estuary of the Garonne River) and the Atlantic Ocean. It is broken into several sub-appellations whose distinctions are subtle, at least to me, and took me some time to perceive. In contrast to Right Bank wines, wines of the Medoc are primarily Cabernet Sauvignon-based, and are tempered with the additions of varying percentages of Cab Franc and Merlot as well as with such lesser varieties as Petit Verdot and Malbec. And while you could find a few blends from the Left Bank AOC’s dominated by Merlot, with Cabernet Sauvignon and others among the lesser percentages, the effect overall are nonetheless consistently leaner and more restrained wines than from the Right Bank, with a more distinguished tannin backbone, and with a lingering earthy, spicy component that is instantly recognizable in most Bordeaux reds. These wines usually benefit from a few additional years’ of bottle-ageing in a cool, dark cellar—or a similar environment. January 2017 Grand Crus de Bordeaux event was my third, and during this event, I felt that I was at last beginning to make some headway. I was detecting distinctions; and I was discovering some favorites among the appellations and within the appellations. The first such distinctions that I noticed were the spicy, earthy, cocoa-like tannins and flavors in the wines from the warmer gravel-and-clay-based soils found in the AOCs of St. Estèphe and Pauillac, the two northern-most appellations. St. Estèphe is situated on a gravel-based soil next to the Gironde estuary and closest to the Atlantic. Pauillac borders St. Estèphe along the estuary just to the south. These are widely described as powerful reds with a strong Cabernet Sauvignon backbone (upwards to 60%), softened and mellowed with varying percentages of both Merlot and Cabernet Franc. These two appellations are the ones I now search out. Not that they are better wines than wines from other of the Bordeaux appellations; rather, it’s just a matter of taste. I am finding the earthy, spicy component that the gravel-and-clay-based fruit imparts to these wines irresistible. Note: the higher the percentages of Merlot and Cabernet Franc in Left Bank wines, the earlier the wines become approachable; the higher the percentage of Cabernet Sauvignon, the longer the bottle-ageing needed. Although not immediately on my mind when I approached my first “Grands Crus de Bordeaux” tasting, some few years earlier, in summer of 2001, I made a 3-day sojourn to the Medoc while staying with friends in Saintes, a couple of hours’ drive north of Bordeaux. I had taken the tiny ferry from Royan, across the mouth of the Gironde Estuary, to debark on the very tippy-tip of the Medoc. From there, I followed a “D” level road through the flat terrains of the Medoc and past several of the famous Premier Growth chateaux to the village of Margaux, where I had booked a room in a Relais du Silence. I arrived in time for dinner, and after, I went for an enchanting stroll through the famed vineyards of First Growth Chateau Margaux under a full moon. A memorable evening! The next morning, my hotel concierge secured an invitation for me to join a small tour group at Chateau Margaux, just a couple hundred meters’ stroll from my hotel along a lane through vineyards. There, a charming professional tour hostess took us through the cellar, including the breathtakingly beautiful white colonnaded chai (the barrel room), and later poured me a full glass of the current release, which, I believe, was the1997. Although it was still well before noon, I savored that wine to the last drop as the hostess and I chatted about wines of the region and also about my book on Zinfandel, which was due for publication by years’ end. I did not, however, purchase a bottle of the Chateau Margaux, which would have cost me more than my few days’ stay at my small hotel. Instead, I later visited a couple of non-classified chateaux, and upon my return to the village, found a wine store where I purchased a two bottles of Cru Bourgeois recommended by the store sommelier as typical expressions of the Medoc, for about $30 each. The visit left a vivid impression on me, but not quite what I expected. While the First Growth chateaux are grand establishments with impressive grounds, gardens, and landscaping, and, generally speaking, require appointments made months ahead of one’s visit, their wines are not the only great wines of the region. 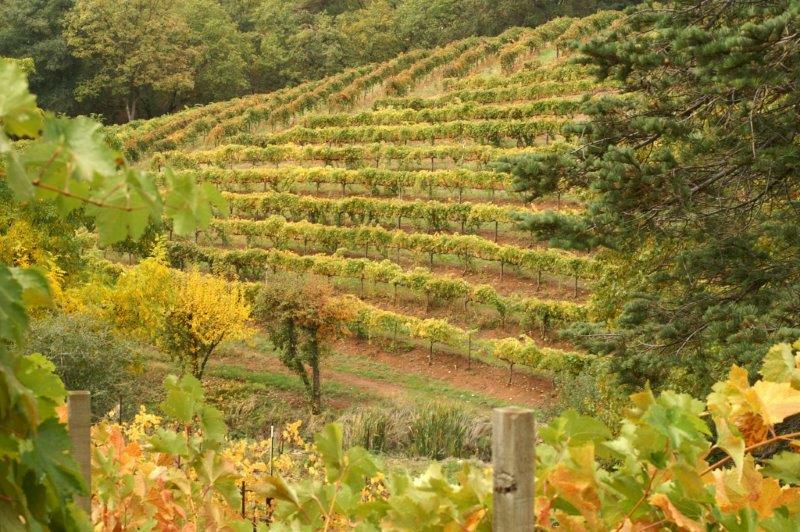 Grand Cru wines, wines from grand vineyards, are as capable of producing superb wines as are the great vineyards, those recognized by the five classification “growths” established in mid-18th century. All that differentiates the Grands Crus from the Premiers Crus, actually, is the prestige associated with Premier Cru classifications—and the pricing. The Grands Crus do not, however, lack the quality . . .and price never has been a score. Union des Grands Crus de Bordeaux, all lovely wines, all structured, balanced, and with long ageing potential (even the Merlot-based! ), are available at prices that will leave you with a budget to shop for a dinner menu to accompany. And I still buy Cru Bourgeois whenever presented with the opportunity. And, yes, I do still think about that bewitching glass of 1997 Chateau Margaux, especially when I approach the Grand Cru Classé tables pouring AOC Margaux. Zinfandel vineyards are the oldest premium wine producing vineyards in California (and probably in the nation) because they were recognized in the 1800s for their winemaking potential by some of the earliest wine growers in the State, many of whom hailed from the best wine regions of Italy and Eastern Europe, and who were looking for something better than the ubiquitous Mission vines. Instinctively recognizing that most of the regions where Mission grew were also well suited to Zinfandel, they grafted their cuttings onto a native rootstock known as St. George, also well suited to Zinfandel. Watered only from the rains that fell during the winter rainy season, the vines were forced to send their roots deep into their piece of earth, which resulted in small crops of intensely colored and flavored grapes. The vines flourished over the decades under such vineyard management, and because the native St. George rootstock was phylloxera-resistant, they survived the epidemic that destroyed much of California’s imported vitis vinifera winegrape vineyards in the late 19th century. 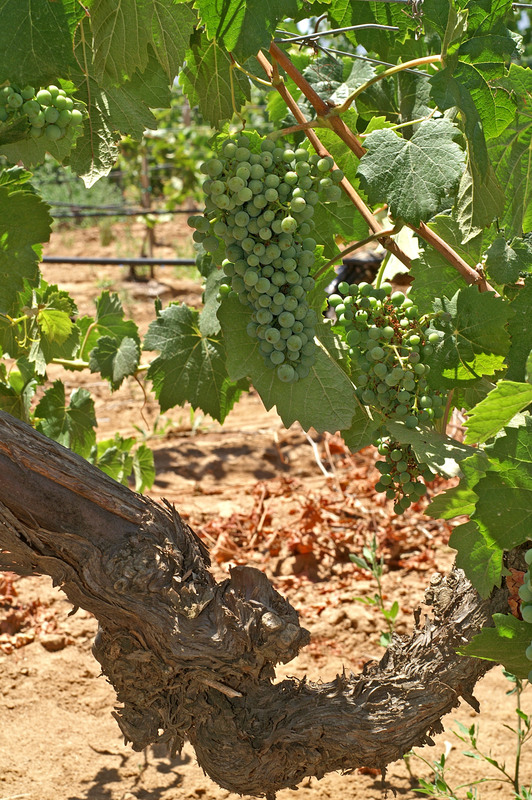 Today, in the early 21st century, Zinfandel vines planted well over 120 years ago are therefore still flourishing. 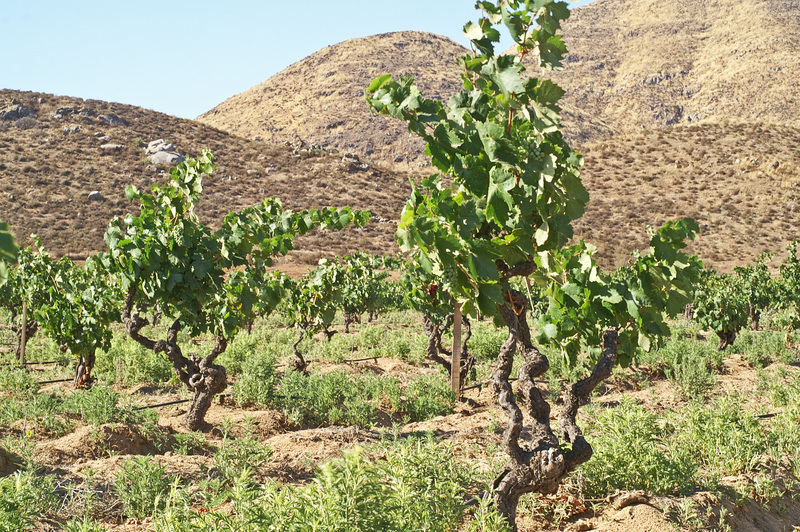 However, the harvesting of these old head-trained vines, whose fruit hangs hidden under the leaves and often low to the ground requires skilled pickers to gather in the grapes at optimum ripeness. When I first stepped into the Bill Moore Zinfandel vineyard that late September morning, I didn’t immediately see the picking crew, who were almost lost among the sprawling vines. When I did catch up to them, I was momentarily mesmerized by what I saw. Their hands seemed to see by touching, so familiar were they with the structure of these old head-trained low-to the-ground vines. Swiftly and with precision their fingers sought out the plump, blue-purple clusters and severed them from their anchors. Even their feet played a part as they deftly moved their tubs onto the next vine, playing them at times as if they were a soccer ball. I had trouble keeping up, so quickly did they clean a vine. It seemed no sooner had I gotten my lens focused on one of the workers, zooming in on his hands, than the hands disappeared and I had to move along with them and try again. 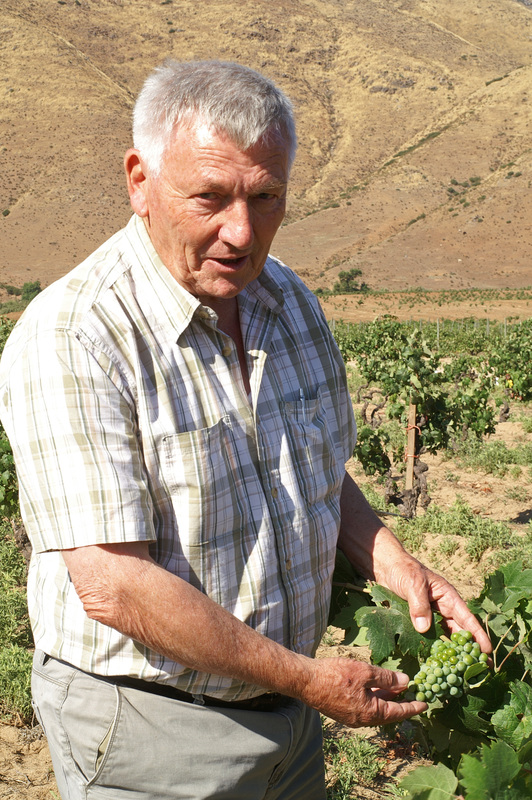 It took no more than 5 seconds for a picker to clean a grape-laden, close-to-the ground old vine. I had to be fast, even with an auto-focus lens. The challenge became interesting and exciting. It had been a startling revolution to me, when I got into my research on Napa Valley Zinfandel in the late 1990s for my book, A Zinfandel Odyssey*, to discover just how many historic Zinfandel vineyards were (and still are) in Napa Valley (Napa Valley, after all, being famous for its Cabs and Chardonnays). One of the most historic and wonderful was the head-trained Bill Moore vineyard on the eastern benchland of the Napa River, just above downtown Napa. 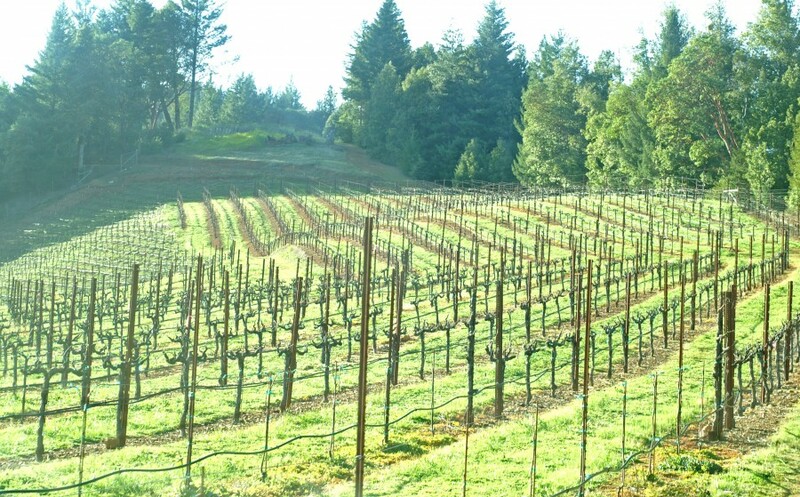 The vineyard consists of 10.6 acres of vines, 95% of which are Zinfandel, with the oldest being planted in 1905 (which inspired one customer to nickname it “Earthquake Vineyard”). I had visited the vineyard a few times in the late 1990s for Old Vine photos, one of which graces the introductory pages of my book. So it was momentous that I encountered Bill Moore purely by chance in late September, a few days before the 2016 harvest of his vineyard was to begin. After a half-hour chat of “catching up,” he invited me to come by for the early morning harvest, which was to take place over the next two days. I was delighted to accept his invitation, since, for various reasons, the Moore Vineyard harvest had been on my mind. I felt I had been given me a second opportunity to get the story of this amazing Zinfandel vineyard. Although I was not early enough the first day for harvest photos, I did manage some stunning images of the clusters at peak ripeness. I actually had gotten into vineyard photography and wine writing when I first arrived in Napa Valley because of the beauty of the old head-trained Zinfandel vines and their clusters of luscious grapes. The second day of picking, I arrived before the sun had cleared the eastern mountains and hot air balloons were floating high over the valley floor. The dozen or so pickers, too, were already hard at work gathering in the crop. After a few minutes of scanning the vineyard to see where they were, I was soon in full pursuit, catching up to the gondolas creeping along the rows as they were being filled from tubs dumped into them, one after another. I was amazed by how quickly the tubs of grapes were coming in. Two women, their heads hooded, their faces partly covered against the dust, stood on the sides of the gondola as “minders,” conducting a field sorting of clusters and debris. When they saw me, their uncovered their faces and gave me a big smile and a wave. They looked happy. It was a beautiful piece of earth to call your place of work! But what struck me most profoundly was the concentration of the pickers as they went about their work. So singularly focused were the men on their vines that, in the words of Colette (“Grape Harvest”), my “entry into the vineyard caused no commotion.” The men hardly noticed me edging in with my camera in hand, seeking an iconic image or two of the grape harvest. When their tubs became full, they hoisted their purple treasures on their heads and moved quickly to the gondola, where they pitched their burden onto the rising mass of grapes. It was all done in one swift movement, then quickly back to the next laden vine in the row. I pursued them tenaciously, and from time to time was rewarded for my efforts by a gloved hand holding a cluster of grapes, the other holding the shears, suddenly coming into focus; a quick snap of the shutter, and the image was made. This went on for about two hours; then suddenly it was over. The vines were bare of their fruit; the gondolas brim-full, and the pickers were going back to their cars and trucks parked in the lane that led to the residential buildings. I followed them, and watched as they paused for a drink and a snack, and then they were gone. The grapes were on their way to the winery, and I was left to peruse my images in hopes that at least a few represented something approximating what I was seeking. 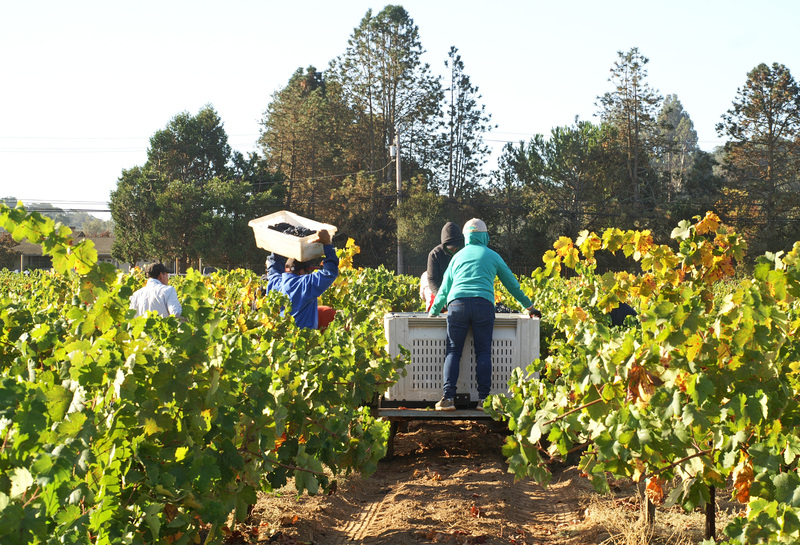 When I looked again through my images a few hours later, I saw gleams of that same joy of the harvest on the faces of my pickers, a joy that brings these pickers back to the vineyards vintage after vintage, to gather the grapes at their peak ripeness. Yet how unlikely it is that people who drink the wine think even once about these dedicated men and women who arrive before dawn to pick the grapes, nor how important, even revered and celebrated, this stage is, in the grape’s journey from the vine to the bottle. For myself, I thought of the steep, rocky hillsides of the Priorat DOQ in Spain, where I had visited in April. 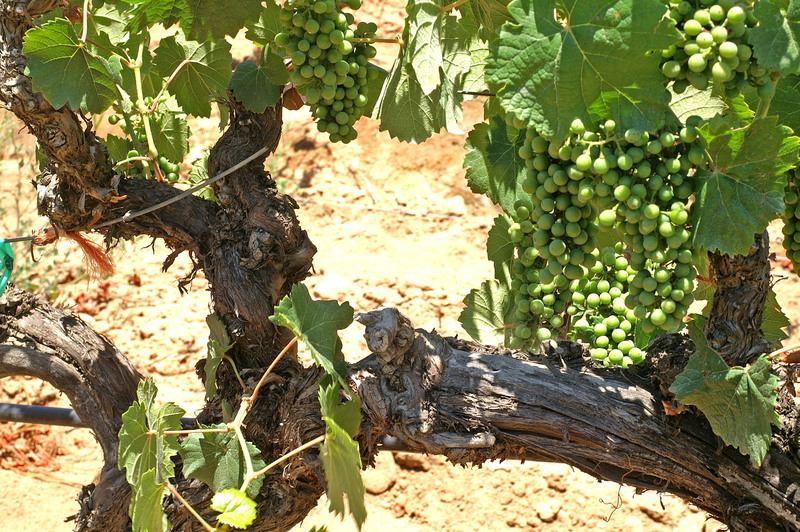 From time to time, my guide pointed out to me the workers toiling among the tiny Garnacha vines high above us. Yet when he and I shared a bottle of Priorat over dinner that evening, I was not thinking of the workers we had seen, but rather, how wonderful was the wine we were drinking. Only later did I stop to consider what it must be like to harvest those vines come fall, to gather in the Garnacha grapes that made the wondrous wine I had just enjoyed. Now, when I read a back label that tells me how the wine in my bottle was made from grapes harvested from old head-trained vines, often grown on steep, rocky hillsides, I stop for a moment to acknowledge those crews of pickers who dragged their tubs over the difficult terrain, where no machine has ever served, in order to bring in the grapes. 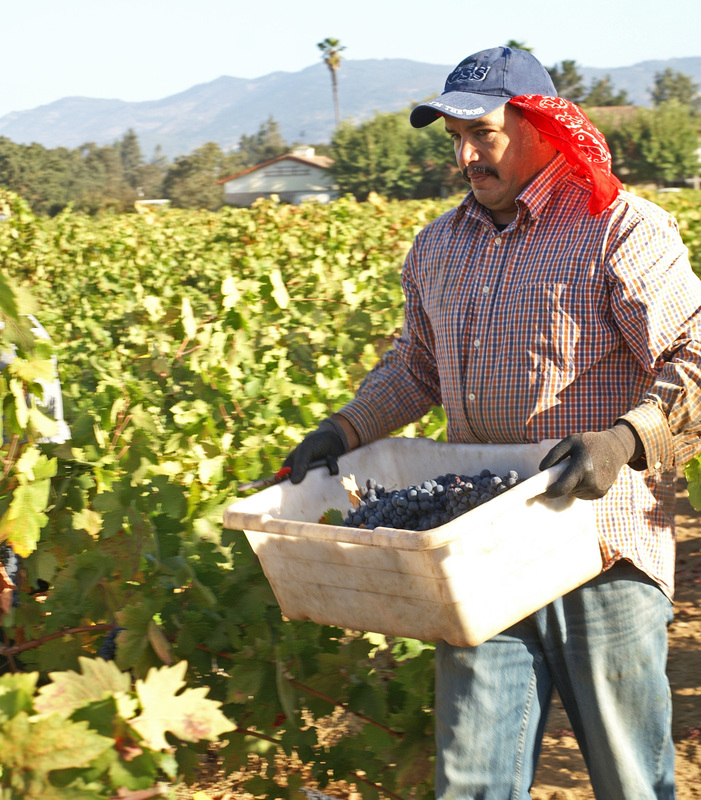 Carefully nurtured over the spring and summer months to reach perfect ripeness, the grapes must now be carefully gathered by the skilled pickers. Without them, the vintage comes to naught. With them, the grapes’ journey towards becoming a bottle of wine that may help someone, somewhere, to make the end of the day just little bit better than it began is officially underway. The pickers’ work is finished. The celebration begins. Salud to the pickers, to all! On a gorgeous first day of spring 2014, I drove with a friend up to El Dorado County, California, for a visit to Boeger Winery, situated on a ridge rising above the historic village of Placerville. 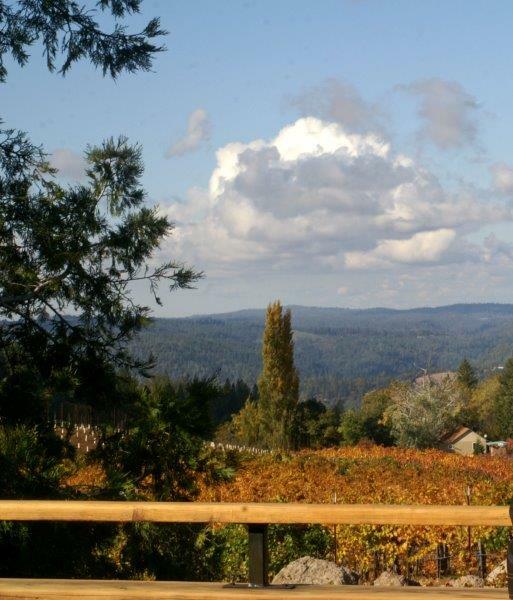 Boeger Winery is a special and historic place to begin your wine tasting visit to El Dorado County. 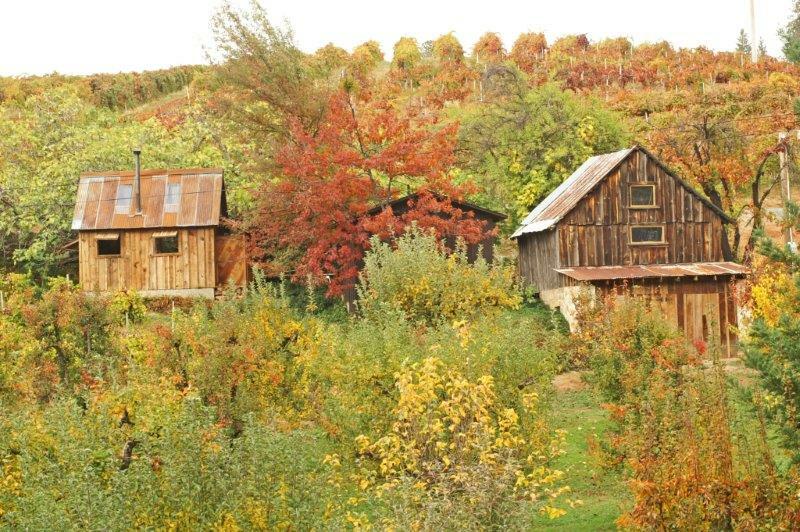 Established by Greg and Susan Boeger in 1972 with four acres of Zinfandel planted on phylloxera-resistant St. George rootstock, it is the oldest winery in the County. Greg and Susan (together with Lloyd Walker: Zinfandel planted in 1968), are also credited with re-establishing winegrape-growing in El Dorado County—some forty years after the 1933 repeal of Prohibition. Their wine offerings today are impressive, featuring in addition to a consistently wonderful Estate Zinfandel from his 1972 plantings a benchmark Barbera and, most recently, a stunning Burgundian style Pinot Noir. It took many years for Greg and Susan to achieve such quality and consistency—twenty years, Greg would say, to the early 1990s for his winemaking and viticulture practices to evolve into the style and quality he knew was possible on that land, especially as concerning Zinfandel. While Amador County was making a big splash with its Sutter Home “Deaver Vineyard” 1968 Zinfandel, the luscious high alcohol and intensely flavored, almost overripe, style of that blockbuster wine was not the style that El Dorado County could produce. In this higher elevation (2100+ feet), cooler region with its thinner, rockier soil, Greg had no modern regional precedents to draw inspiration from. Furthermore, Greg was also interested in discovering what other premium varieties might do well in his vineyards besides Zinfandel, and so his Zins were mostly left to their own resources. After all, his property had remnants of old Zinfandel vines dating to the mid-1800s; Zinfandel had obviously survived, even thrived, in the region for 100 years. But the results of such laissez faire practices showed in many of the early vintages: they could be a bit weak, said Greg, with a lighter, more fruity character. These wines became something of a benchmark for El Dorado County Zinfandel. Boeger Winery had also found white varieties such as Chardonnay suited to the region and the soils, Barbera and, most recently, Pinot Noir. 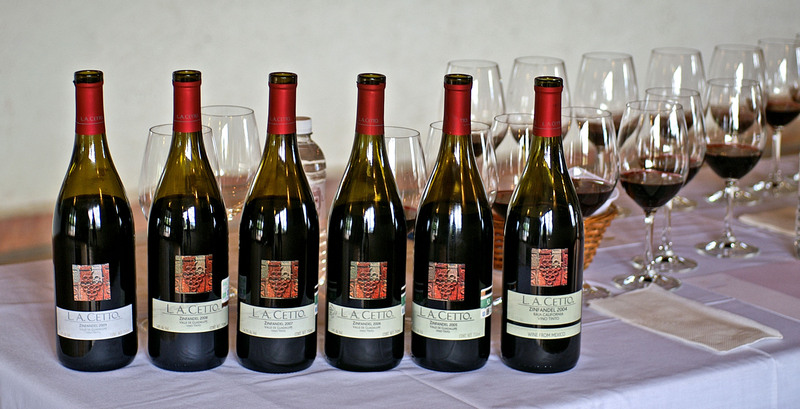 The Pinot Noir is after the fashion of some of Burgundy’s more elegant and delicate PNs. A bewitching wine, it’s nothing like the PN’s you will find coming out of such low-elevation American Viticulture Areas (AVA) as the Carneros of Napa County, or Mendocino County’s Alexander Valley. I found Greg’s 2011 to be an elegant wine with delicate raspberry notes balanced with some understated spices and a long finish, a wine that should do well in a cool dark cellar for a couple or three more years. It’s a wine, however, that should you today put it before guests who appreciate European style wines, I recommend you have a backup bottle or two on hand! 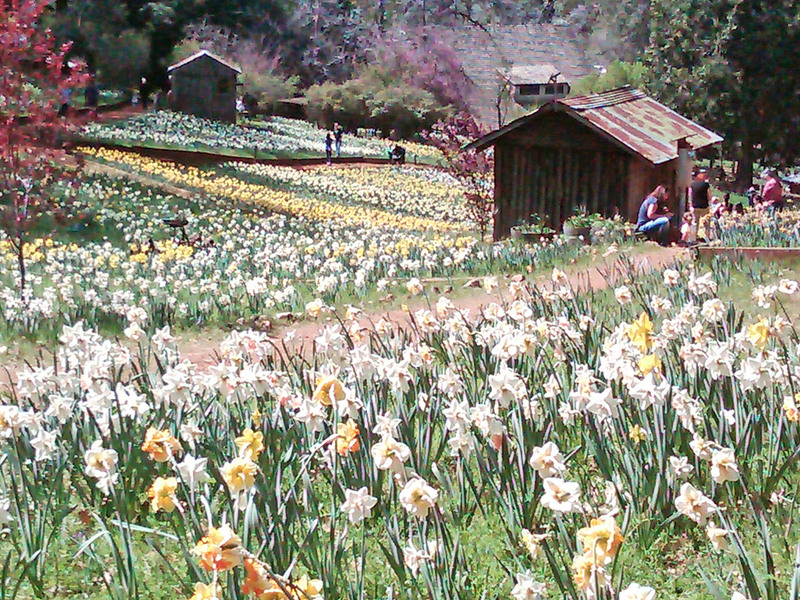 I didn’t get beyond Boeger Winery on this visit to El Dorado County, since my friend and I were also taking in Daffodil Hill, a few miles to the south, in Amador County, that morning. So my favorites at the end of the day were Greg’s 2012 Zinfandel Estate (the fruit from the 1972 vines supplemented since the mid-1990s by fruit from his Old Vine cuttings grafted onto French Columbard rootstock), the 2009 Barbera Vineyard Select, and the 2011 Pinot Grand Reserve. I made my first visit to Boeger Winery in 1996, when I was launching my investigation of the Sierra Foothill Zinfandels for my book, A Zinfandel Odyssey (2002), just in time to taste the impressive results of Greg’s new viticulture practices. 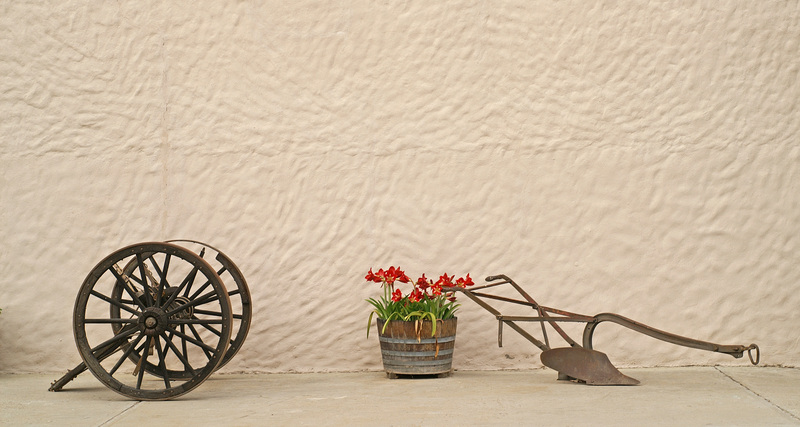 With its unbroken 40-year history of family ownership, Boeger Winery provides its visitors a taste of history, a taste of the evolution of a tradition, in every sip of wine. Greg and Susan’s son, Justin, now the winemaker, ensures that the family tradition continues. Established by Greg and Susan when they were just a couple of kids with a passion for their venture, Boeger Winery is a nice place to begin your exploration of the wines of the high Sierra Foothills, and to be reminded that there still are regions in California where family-owned “estate” wineries are the rule, a way of life, and not the exception. 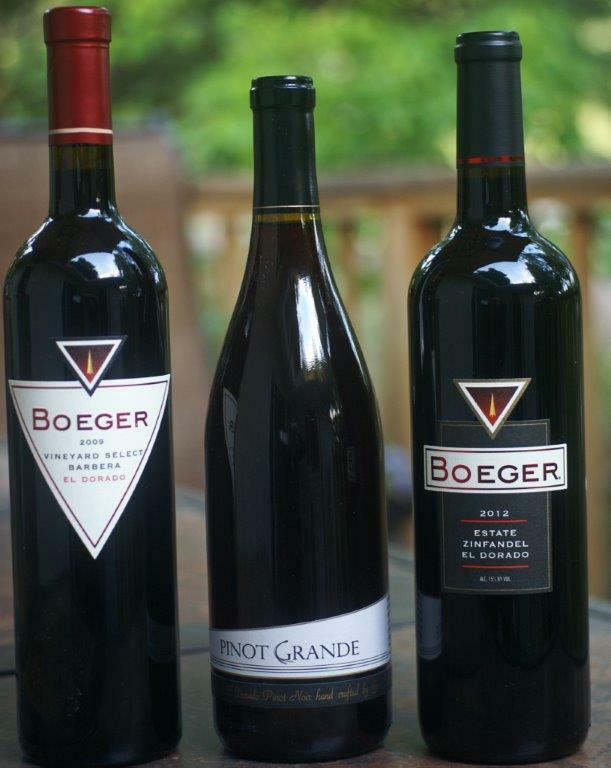 Today, Boeger Winery is just one of a growing collection of family-owned estate wineries in El Dorado County dedicated to making hand-crafted wines that express the piece of ground the vines grown in. A visit to any of these estates will be memorable not only for the lovely wines at affordable prices but also for the rustic charm, warm hospitality, and spectacular views from many of the ridge top locations. I’ve been thinking about this for some time now, because it’s always so dramatic when it happens: you pour a glass of wine for your friends and suddenly all conversation stops. The sheer beauty and deliciousness of the stuff in their glasses has bewitched your friends’ senses. Time stands still while everyone savors the fragrant aromas wafting from the glass and the incredible sensations in the mouth . . .an experience heady and rare. I have three distinct memories of such wines. Each is from a region best suited to the variety, and displays the central characteristics of the variety produced from vines grown in that particular piece of ground. My first such experience happened in January 2006; the wine was a Latcham Winery (El Dorado) 2003 Special Reserve Amador County Barbera ($25). 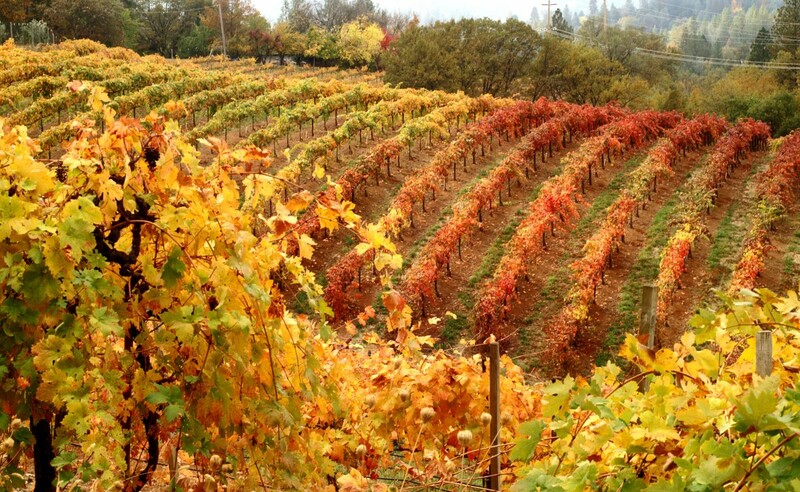 Amador County is well-known as an ideal region for Barbera as well as for its historically famous Zinfandels. I had discovered this lovely Barbera a year earlier, when on a guided tasting tour of El Dorado County wines with Les Russell, founder of Granite Springs Winery. As partial as I am to the El Dorado Zinfandels, it was Latcham’s Amador County Barbera that stole the show for me that day. With a deep garnet purple color, bewitching aromas of black currants, black berries, plums, and rich spices, together with the big bold, succulent flavors of ripe warm blackberries and dense ripe plums typical of Amador County, yet with soft tannins and a velvety texture unlike anything I’ve ever experienced, it was a wine to set you dreaming. So I bought a half-case, and in January 2006, took a bottle with me to Victoria, Canada, to celebrate the New Year with a couple of my favorite cousins up there. A few days after arriving, my Victoria cousins and I drove up island to Qualicum Beach for a visit with another West Coast cousin. Lunch was almost ready when we arrived. While we were standing about in the kitchen that quiet afternoon along the Strait of Georgia, catching up on family and other news, I opened the Barbera, poured it out, and handed it around. Although it greatly impressed me in the tasting room, I hadn’t tried it since. But before I had a chance to ask “how is it?” conversation had stopped. There was no need to ask how it was. The looks of bliss on my companions’ faces told the story! The wine was gorgeous. It was a wine to savor in silence. And a wine I still dream of. Because wines that can stop conversation are so rare, when it happens, it reminds one of just how mysterious, almost magical, is the process of turning grapes into wine. So many factors figure in: viticulture practices, crop yield, harvest date, winemaking practices. While these factors through human intervention can be nearly replicated year after year, the effect of weather over the course of the year on the vintage produced from a particular piece of the earth is in Mother Nature’s hands alone. These mysterious, indefinable, and unpredictable components of each vintage are Mother Nature’s gifts to the magic of wine, and help to explain why each vintage from a great piece of earth will always differ, if only slightly, from every other vintage, and why those conversation-stopping beauties that occasional materialize from great pieces of earth are as elusive and mysterious as the will o’ the wisp . . .to be enjoyed in silence, and replicated only in one’s memory. Next posting will present conversation-stopping wines II (Madrian) and III (Zinfandel). Zinfandel from the higher elevation American Viticultural Areas (AVAs), notably the Sierra Foothills (above 2,000 feet) and Mendocino Ridge (the unconnected vineyards on the coastal ridges in the southwest corner of Mendocino County at elevations above 1200 feet), are among my favorites. 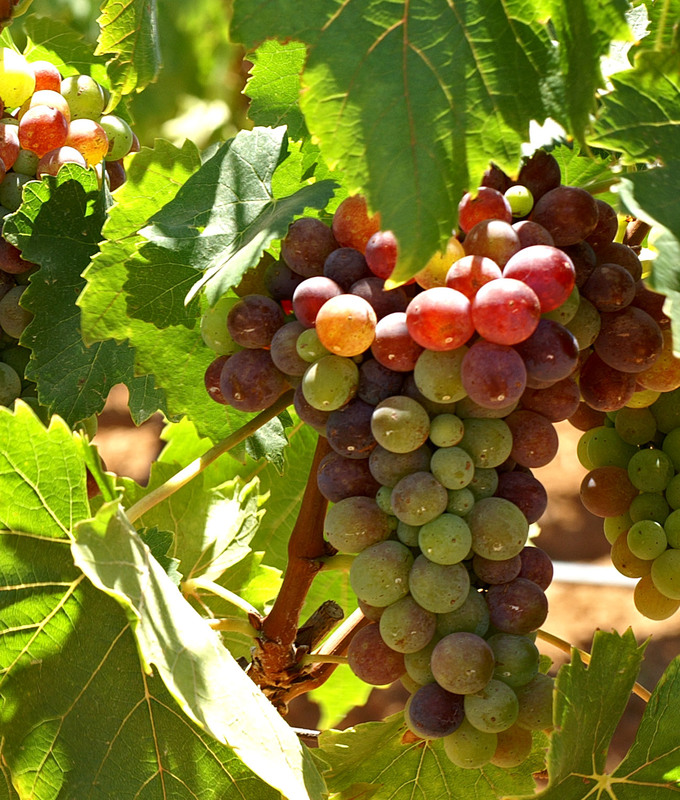 Both regions get plentiful warm sunny days and cooler nights (known as “diurnal temperature shift”), which means more even ripening in this traditionally uneven ripening variety, and higher acids to balance the sugar content in the fully ripened fruit. When visiting the 2013 ZAP event in SF this past February 02, I searched out Zins from these two Zinfandel regions. 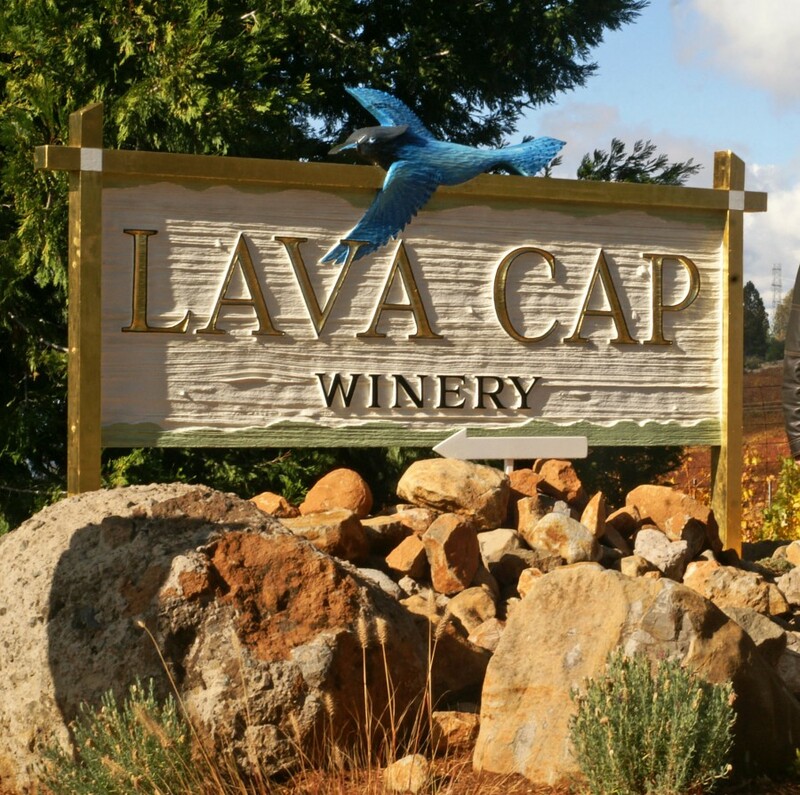 In the El Dorado County region of the Sierra Foothills AVA, Lava Cap has become one of my favorites. 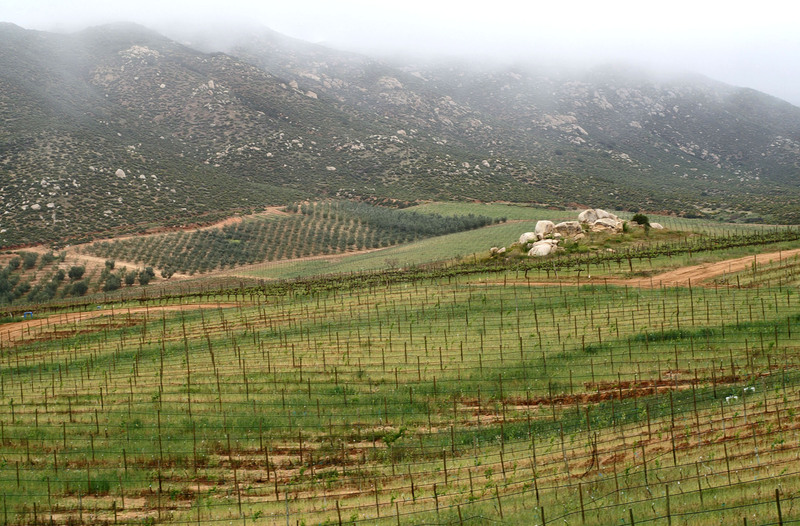 It produces two outstanding Zinfandels: The Reserve Estate and the Rocky Draw. The soil in these vineyards, which sit at about 2800 feet, is a cobbly, reddish gravelly loam of volcanic origins (hence the winery’s name Lava Cap). The wines that come from them are beautifully balanced full bodied, full flavored specimens, luscious in the mouth, and with layers of blackberry, some hints of earthy herbs, a dusting of spices, and a layer of dark caramel swirling throughout. The Rocky Draw also has distinguishing notes of dark chocolate. Never over-oaked, both wines have been aged in 1/3 new French oak barrels for about 14 months, and come in just under 15% alcohol. These wines are a pleasure to drink at release (2 – 3 years after vintage date); they also will benefit from a few additional years in your cellar. And because they are from the Sierra Foothills, they are a price point or two below comparable value from such prestigious north coast regions as Napa and Sonoma Valleys. My other mountain vineyard favorite (and also that of my companion at the ZAP 2013 event–not that we tasted everything) was Edmeades Perli Zinfandel, from the Mendocino Ridge AVA. Perli Vineyards are grown in lily-pad like plantings high up on Fish Rock Road. The micro-climate of Mendocino Ridge AVA vineyards is remarkable in that the vineyards are above the fog line, and so benefit from the diurnal temperature shift from day to night. The days are warmer and the nights cooler than in Anderson Valley. There’s also something special about the light! 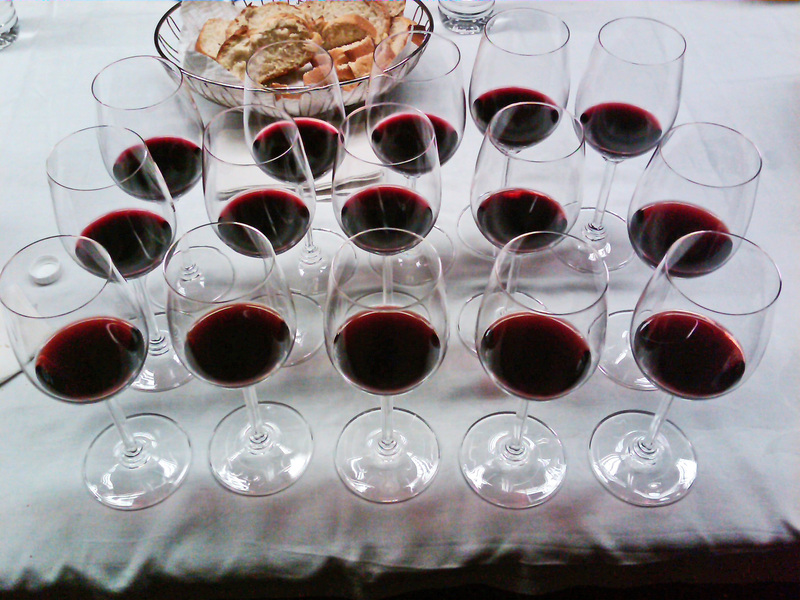 While these were my favorites among the Zinfandels tasted at this event, they are not my only Zinfandel favorites. More on some of my other favorite Zins in future posts.